A comparative analysis of the mean glandular doses was conducted in 100 female patients who underwent screening mammography in 2011 and 2013. Siemens Mammomat Novation with the application of the W/Rh anode/filter combination was used in 2011, whereas in 2013 anode/filter combination was Mo/Mo or Mo/Rh. The functioning of mammography was checked and the effectiveness of the automatic exposure control (AEC) system was verified by measuring compensation of changes in the phantom thickness and measuring tube voltage. On the base of exposure parameters, an average glandular dose for each of 100 female patients was estimated. The images obtained by using AEC system had the acceptable threshold contrast visibility irrespective of the applied anode/filter combination. Mean glandular doses in the females, examined with the application of the W/Rh anode/filter combination, were on average 23.6% lower than that of the Mo/Mo or Mo/Rh anode/filter combinations. It is recommended to use a combination of the W/Rh anode /filter which exhibited lower mean glandular doses. Mammography is one of radiographic techniques for examining breasts in females for detecting micro changes, which are otherwise undetectable in the palpatory examinations. Due to the application of state-of-the-art technology (digital detectors), high quality images could be obtained under constrains of smaller doses of ionizing radiation. Mammography is widely used in screening examinations of breasts in females aged 50-69, particularly threatened with neoplasm. While performing a medical examination on female patients, who may not be affected by cancer but who belong to a risk group, a care need to be exercised for radiation dose used during mammography. The dose depends on: the quality of radiation, anode/filter combination, radiation detector (screen-film, digital radiography, computed radiography), and thickness and composition of breast as well as exposure parameters. ,, The study presents the analysis of the effect of the change of anode/filter combination on the glandular dose in female patients who underwent screening examinations in a period of 2 years. The patients included in this study were examined by using Siemens Mammomat Novation mammograph, manufactured in 2007. The device was equipped with three anode/filter combinations (Mo-Mo, Mo-Rh, and W-Rh) and the automatic exposure control (AEC) system, which identifies breast thickness and automatically selects exposure parameters. It has a completely digital image detector based on amorphous selenium. One hundred women patients aged 50-69 years, who qualified for screening mammography every 2 years, were included in the study. In the present case, the women had mammography in 2011 and 2013. Each woman had two projections for each breast, viz. i) craniocaudal (CC) and ii) mediolateral oblique (MLO). The women were examined on the same mammograph, however, W-Rh anode/filter combination was used for those examined in 2011 and Mo-Mo or Mo-Rh combinations for those examined in 2013.
s - an index referring to the spectrum of X-ray radiation. (1). The dose on the surface of the table  was measured with the Piranha multimeter, calibrated in ranges used in mammography. In order to compare results of the average glandular dose, measurements were made by using poly (methyl methacrylate) (PMMA) plates which resemble particular breast thickness. 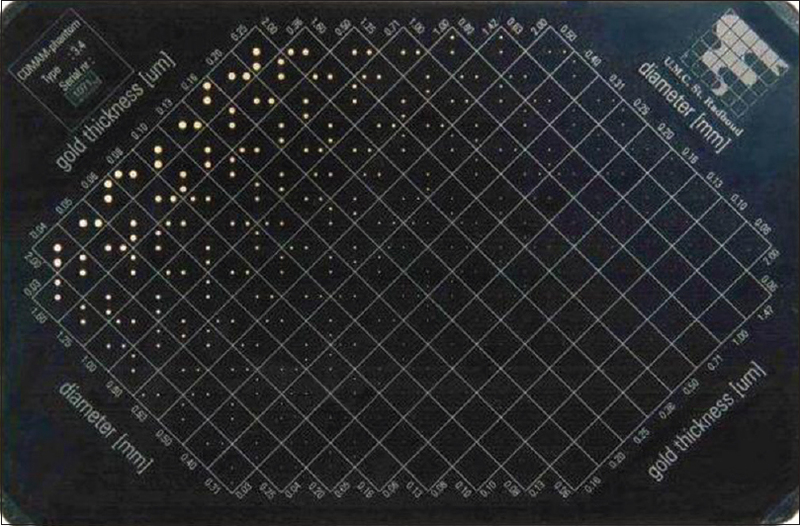 In this case, the parameters of the mammograph (kV values, mAs, anode/filter combination) for various thicknesses of the PMMA plates were defined and air kerma values on the surface of the table were measured. With the information on the half-value layer for various tube voltages, the average glandular dose was calculated. The thickness of breasts simulated by PMMA plates , were considered for computation. The detailed method of making measurements as well as all indices was the same as in the European protocol. It may be noted that although the image quality calculated with the use of threshold contrast visibility is the most important parameter in each imaging examination, the dose is also an important parameter. In order to calculate the threshold contrast visibility, a CDMAM phantom  was used. The phantom had an aluminum base on which gold discs of various diameters and thicknesses were placed in carefully selected areas. In each of the 205 cells, there were two gold discs; one was placed exactly in the middle of the cell and the other was placed at a randomly selected corner. By identifying the location of a particular pair of the gold discs in each cell, it was possible to calculate threshold contrast visibility. The image contrast could be different and it would depend on the visibility of the image of the discs [Figure 1]. standard deviation of mean value pixels in the image of the phantom. T limit - limit value of threshold contrast. All the measurements were made in the automatic mode, where the device autotically selected exposure parameters on the base of breast thickness. The image analysis was conducted with the use of Image J 1.44p software. It allows to measure the mean value of pixels and standard deviation of mean value pixels. The control of quality of the mammograph was ensured before initiating the study. The effectiveness of the AEC system was verified by measuring the changes in the phantom thickness and the tube voltage. [Table 1] and [Table 2] present the results. The AEC selected the voltage values after it had identified the breast thickness after compression. In 2011 AEC system selected kV values depending upon the thickness of the phantom as follows: For 3 cm - 25 kV, from 3.1 to 4.5 cm - 27 kV, from 4.6 to 6.0 cm - 28 kV, and above 6 cm - 32 kV. In 2013, the AEC system worked as follows: For 3 cm - 26 kV, from 3.1 to 6.0 cm - 27 kV, and above 6 cm - 32 kV. Another test which was performed included a control of the image quality by measuring the threshold contrast visibility for clinical exposure. Right anode/filter combination and voltage were set which were selected by the system (AEC). Eight images were produced in a manual mode, while measuring compensation of changes in the phantom thickness as well as tube voltage. The value of mAs was set manually and it was closest to the one selected by the AEC system. 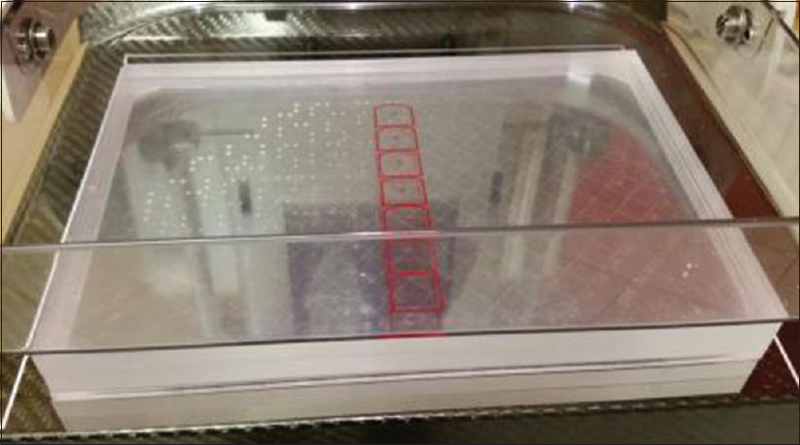 The thickness of a CDMAM phantom with PMMA plates corresponded to a phantom with PMMA plates (5 cm thick), which explains the selection of exposure parameters. The images were analyzed with 62.5% value detectability. [Table 3] presents the measurements of the threshold contrast visibility [Figure 2]. [Table 4] presents the measurements of the average glandular dose for clinical exposure for the breast thickness simulated by PMMA. It is particularly important as the AEC system is commonly and routinely used in everyday practice. To avoid excessive doses of radiation the relationship should be periodically controlled. [Figure 3] and [Figure 4] present a relationship between an average glandular dose and mAs for particular voltage values in the patients examined during 2011 and 2013; the R 2 coefficient was taken into account. By measuring doses for particular exposure, the average dose for a woman during one examination procedure was calculated [Table 5]. [Table 6] and [Table 7] present the calculated average glandular doses for the patients examined during 2011 and 2013 and included in screening mammographic tests. [Table 6] also presents mean exposure parameters. Threshold contrast is a parameter which refers to the quality of the image obtained in an examination. Regardless of the parameter combination in the clinical exposure, the threshold contrast visibility must remain below acceptable values. In tests of the image, the threshold contrast conducted during 2011 and 2013 before the commencement of screening examinations, the contrast calculated for all diameters of gold discs, that is, 0.1; 0.25; 0.5; and 1 mm is below acceptable values which are 1.680, 0.352, 0.150, and 0.091, respectively. The imaging quality of this device is excellent. The value of the threshold contrast visibility remains within standards; it is not only acceptable but also achievable, that is, more restrictive [Table 3]. Stabile work of the AEC system is another important parameter in functioning of a mammograph. The measurements of compensation changes in the phantom thickness and tube voltage performed during 2011 and 2013, confirm that the system works properly despite excluding the Wolfram anode, that is, despite introducing completely different exposure parameters. After changing the anode/filter combination the device was calibrated by the service. While analyzing the AEC system, it may be remembered that selected the value of mAs has to correspond to the thickness of a compressed breast and the voltage applied to an X-ray tube. The AEC system working with the W/Rh, Mo/Mo, or Mo/Rh combinations selects tube voltage. 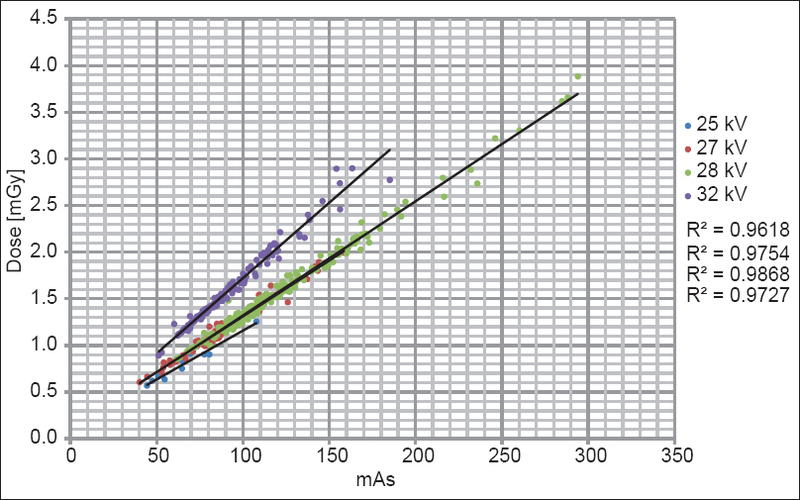 [Figure 3] shows that correlation coefficients between average glandular dose and mAs values for particular tube voltages are extremely high and range between 0.96 for 25 kV and 0.99 for 28 kV. A similar relationship can be observed for the Mo/Mo and Mo/Rh combinations [Figure 4]. In this case, correlation coefficients ranged from 0.82 for 26 kV to 0.96 for 32 kV. Here, it should be pointed out that three exposures were performed by opting 26 kV tube voltage. 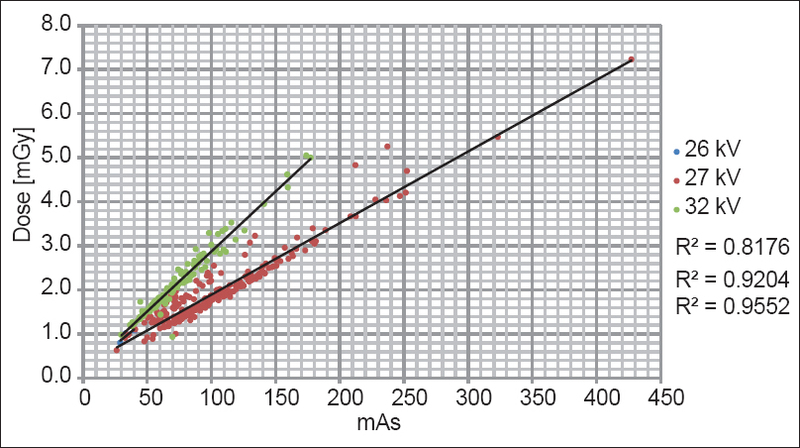 It can be observed that there is a linear relationship between the dose and mAs values for any particular tube voltage. Thus, we can conclude that the system properly selected the mAs values after identifying the tube voltage dependent on breast thickness after compression. The above parameters, that is, the threshold contrast visibility and stability of the AEC system, are the reference points for the measurements of the average glandular doses. The doses can be compared only if the above parameters are adequate. In the first stage of dose analysis, we should determine the values by using a PMMA phantom resembling the breast. [Table 4] presents measured average glandular doses with the application of the PMMA phantom. The results confirm that the doses established for three thickness values during 2011 and 2013, that is, 2, 4.5, and 7 cm were below acceptable standards. In 2011, that is, in the year when the W/Rh combination was used, the doses remained lower than those in 2013, that is, when the mammograph worked with the application of the Mo/Mo and Mo/Rh combinations. For W/Rh combination, all doses were within achievable value. After the application of the Mo/Mo and Mo/Rh combinations, the doses were within achievable value only for thickness values of 4.5 and 7 cm. With regards to an average glandular dose for the Mo/Mo and Mo/Rh combinations, we observed that the doses obtained after the application of the Mo/Rh combination were 10% (P = 0.0001) higher than after the application of the Mo/Mo combination and are 1.99 ± 0.81 and 1.79 ± 0.77 mGy, respectively. The higher dose obtained after the application of the Mo/Rh combination results from greater breast thickness after compression. However, when we calculated the doses per centimeter, we obtained 0.46 mGy/cm for the Mo/Mo combination, 0.33 mGy/cm for the Mo/Rh combination, and 0.28 mGy/cm for the W/Rh. This confirms the fact that application of higher energy X-ray decreases the dose received by a patient. For doses received by a particular patients in each of the four mentioned projections, the average dose was 1.43 ± 0.45 mGy for the P/CC and L/CC projections during the application of the W/Rh combination. For the P/MLO and L/MLO projections, the dose was 1.55 ± 0.53 mGy. It is 8.4% (P = 0.014) higher than in the CC projection. For Mo/Mo and Mo/Rh combinations, the average dose for the P/CC and L/CC projections was 1.87 ± 0.73 and 2.04 ± 0.87 mGy for the P/MLO and L/MLO projections. It was 9.1% (P = 0.042) higher than in the CC projection. 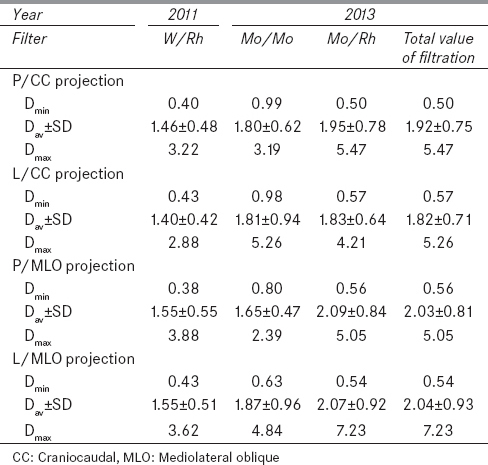 The difference between the CC and MLO projections results from the structure of tissues examined in these projections. 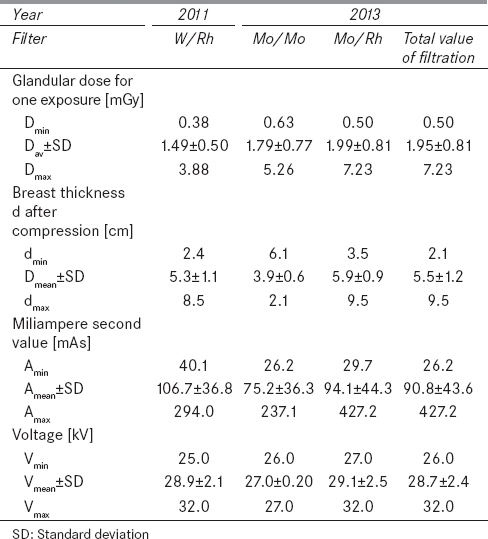 The average glandular dose for one exposure procedure was 23.6% (P = 0.0001) lower in the case of the W/Rh anode/filter combination (1.49 ± 0.50 mGy) than that in the case of the Mo/Mo and Mo/Rh anode/filter combinations (1.95 ± 0.81 mGy). Despite increase in the average glandular dose, the average glandular dose limit (2 mGy) was not exceeded. In digital mammography it is advisable to use the anode/filter combination of W/Rh as it provides higher energy X radiation than the anode/filter combinations of Mo/Mo and Mo/Rh as the quality parameters of the digital image are less sensitive to changes in energy of X radiation in comparison with an analogue image. In such cases, decrease in radiation energy does not considerably contribute to the changes in the image parameters, but allows to decrease the dose to patients. In this particular device the exclusion of a Wolfram anode resulted in an increase in the glandular dose in patients, but it did not cause any change in the image quality. In order to make diagnostic process more optimal, Wolfram anode should be applied to decrease the doses to patients. Fischer U, Hermann KP, Baum F. Digital mammography: Current state and future aspects. Eur Radiol 2006;16:38-44. Chen B, Wang Y, Sun X, Guo W, Zhao M, Cui G, et al. Analysis of patient dose in full field digital mammography. Eur J Radiol 2012;81:868-72. Toroi P, Zanca F, Young KC, van Ongeval C, Marchal G, Bosmans H. Experimental investigation on the choice of the tungsten/rhodium anode/filter combination for an amorphous selenium-based digital mammography system. Eur Radiol 2010;17:2368-75. Baldelli P, Phelan N, Egan G. Investigation of the effect of anode/filter materials on the dose and image quality of a digital mammography system based on an amorphous selenium flat panel detector. Br J Radiol 2010;83:290-5. Emanuelli S, Rizzi E, Americo S, Fasano C, Cesarani F. Dosimetric and image quality comparison of two digital mammography units with different target/filter combinations: Mo/Mo, Mo/Rh, W/Rh, W/Ag. Radiol Med 2011;116:310-8. Perry N, Broeders M, de Wolf C. European guidelines for quality assurance in breast cancer screening and diagnosis. Nijmegen; 2006. Perry N, Broeders M, de Wolf C. European guidelines for quality assurance in breast cancer screening and diagnosis - supplements. Nijmegen; 2013. Dance DR. Monte Carlo calculation of conversion factors for the estimation of mean glandular dose. Phys Med Biol 1990;35:1211-9. Dance DR, Skinner CL, Young KC, Beckett JR, Kotre CJ. Additonal factors for the estimations of mean glandular breast dose using the UK mammography dosimetry protocol. Phys Med Biol 2000;45:3225-40. Dance DR, Young KC, van Engen RE. Further factors for the estimations of mean glandular dose using the United Kingdom, European and IAEA dosimetry protocols. Phys Med Biol 2009;54:4361-72. Burght R, Thijssen M, Bijkerk R. Manual contrast-detal phantom CDMAM 3.4; 2010. Kenneth CY, at all. "Evaluation of software for reading imagesof the CDMAM test object to assess digital mammography systems" Proc. SPIR 6913, Medical Imagining, 2008. Veldkamp WJ, Thijssen MA, Karrsemeijer N. The value of scatter removal by a grid in full field digital mammography. Med Phys 2003;30:1712-8. Young KC, Cook JJ, Oduko JM, Bosmans H. Comparison of software and human observer in reading images of the CDMAM test object to assess digital mammography systems. In: Flynn MJ, Hsieh J, editors. Proceedings of SPIE Medical Imagining; 2006, p. 1-13. Nisbet R, Elder IV J, Gary Miner G. Handbook of Statistical Analysis and Data Mining Applications. Oxford; 2009.